I have been wondering if the nearest shell splash in this photo is from one or multiple 14inch shells. Battleship Command: Scharnhorst - A work in progress, indie, naval warfare simulator. The splash in that photo is from a 14-inch shell fired by PoW's "Y" Turret under local control, AFTER the sinking of the Hood. 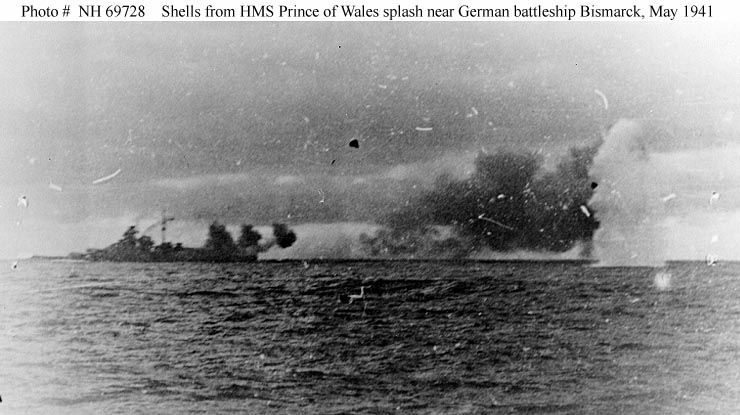 The shell appears closer to the camera than to Bismarck, so the intended target nor firing ship is not clear, IMHO. Eine der letzten Granaten der "Hood", die als Weitschüsse in die See fuhren. Im Hintergrund die Breitseite feuernde Bismarck. It is not a 14 inch shell at all, and it was not fired at the Bismarck. 2) There is only 1 more splash in the film in an around 2 minutes lasting movie, therefore no coordinated salvos from Hood or PoW (3 or 4 shells) at all, only single shells. 3) the second splash in the film (below) is salvo 21 from PoW under local control, clearly more close to Bismarck (as Alwin was adjusting his fire). It must have been very exciting aboard PG as these shells which land just beyond the "danger space" area for that ship, passed over her structure. No wonder those aboard, Lagemann and Busch recorded them as coming from Hood, because they watched them fired, knew the time of flight and saw them land. Thank you gentlemen, for the answers! How very intimidating those splashes must have been. Enormous in size. Just try to imaging how intimidating the salvos fired by Hood and PoW were at an earlier stage of the battle, when we don't have a film (https://www.youtube.com/watch?v=pPmkOtSveXY). From 5:58 till 6:01, Bismarck was hit twice and was certainly surrounded by the director controlled 3 to 4 (average) shells semi-salvos fired twice per minute from PoW, while PG was surrounded (until 6:00) by the 3 or 4 shells semi-salvos from Hood, washing her decks. A pity we don't have such images in the film. the splash is obviously from PoW local salvo 20 (as Mr.Rico confirmed). Yes, from PoW, but to which salvo it belongs is debatable. Does that mean that out of shot there would be another shell splash (or another 2 or 3 depending on the salvo fired)? It means that I would not go as far as to assure that splash is from salvo #20 as Alberto said. you wrote: "Yes, from PoW, but to which salvo it belongs is debatable"
I see what you mean, it depends on how you read photo NH69731: I say it shows PoW salvo 19, falling very short on port side of PG. The photo is clearly taken quite after 6:03, with PoW already at the end of her 160° turn. The first splash in the film is a single one (I agree, it could be that the second one is out of the camera field...), and had the salvo been the 19, they would be two of them. Also if the first is salvo 19 (and the second is 20) , I don't see the third splash (salvo 21) in the film (again it could be out of the camera field, however a bit too many coincidences together...). The camera picks up that splash at about 3:04 and we watch as the splash column collapses but at 3:14 the camera pans left and we can see the 2nd shell splash from the same salvo collapsing as well; this is a very brief event as the 2nd splash is nearly gone by the time the camera pans onto it. Set your Youtube player to .25x speed to see clearly. The first photo in this topic is also a still from the same film and IMHO, the 2nd shell from that salvo is also out of the frame. However, the film actually catches the first shell before it strikes the water (although invisible on the film) and if you start at 2:44 with the player in .25x speed, you can watch the splash erupt from the water. Note also how the splash collapses and the similarity of final view to the nearly collapsed shell splash at 03:14. So we have, IMHO, two x 2 gun salvos being captured on the film and the salvos fall about 20secs apart, which is a good fit for Hood's salvo rate. Last edited by dunmunro on Sat Apr 06, 2019 10:02 pm, edited 1 time in total. Dunmunro wrote: " this is a very brief event as the 2nd splash is nearly gone by the time the camera pans onto it." The "2nd splash" is IMO something in the sky or on the film support and not a splash. Please show me a similarity between the splashes and the "mark" in the sky visible at 3:14. Dunmunro wrote "IMHO, the 2nd shell from that salvo is also out of the frame." ...however PoW fired 4 rounds in 3 salvos, therefore no chance there are 2 salvos of 2 shells. ...at least if someone doesn't want to resurrect the theory that the shells are from Hood... Hood had been sunk 3 minutes before...Please look at the course of Bismarck (around 270°) and at the turn of PG to starboard at the start of the film: the film is surely turned after 6:03, because before that timing both German ships were sailing on course 220° and PG did no turn at all until 6:04 (we do have the PG precise track, luckily, to prevent further fantasy exercises). Last edited by Alberto Virtuani on Sat Apr 06, 2019 10:23 pm, edited 1 time in total. Please show me a similarity between the splashes and the "mark" in the sky visible at (your film version) 3:14. At least if someone doesn't want to resurrect the theory that the shells are from Hood... Hood had sunk 3 minutes before...Please look at the course of Bismarck (around 270°) and at the turn of PG to starboard at the start of the film: the film is surely turned after 6:03, because before that timing both German ships were sailing on course 220° and PG did no turn at all until 6:04 (we have PG precise track, luckily). If it was something in the sky it would remain in the same place and have the same shape as the camera pans back and forth across the same area, but like the other two splashes (2:45 + 3:04) the 3rd also fades from view.